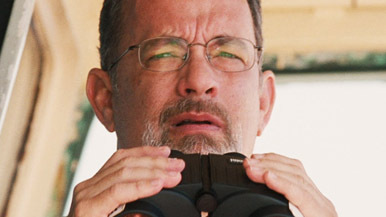 As a thriller, Captain Phillips is bold and impressive in the way it’s able to sidestep clichés and sustain credibility, convincing us that what happens on-screen is probably a fair representation of what happened to the titular man in real life. The film is based on the memoir by Richard Phillips with Stephen Talty, titled, A Captain’s Duty: Somali Pirates, Navy SEALS, and Dangerous Days at Sea, and recounts his harrowing, five-day captivity by four Somali pirates. It’s devoid of gimmicks, false heroics and sensational action sequences, which we can appreciate on one level because we believe the film is being loyal to its source and paying respect to all the people who lived through the ordeal. And yet, on another level, that the film chooses to play things so straight makes it feel strangely uneventful and irrelevant - as a Hollywood narrative, that is. Don’t get me wrong; by the end, director Paul Greengrass and star Tom Hanks have successfully put us in Phillips’ shoes, and we feel for and care about the man, but I can’t help but wonder if his story would have been better told as a documentary. As a thriller, it lacks thrills, despite its authenticity. Hanks plays Richard Phillips, captain of the Maersk Alabama, a cargo ship en route to Mombasa, Kenya carrying, among other things, food for starving people, a fact that Phillips no doubt hoped would earn him points and respect with his captors. Days into the ship’s voyage, the captain and crew’s worst fears about traveling around the horn of Africa come true when four pirates, armed with AK-47s, make their way on-board and demand millions of dollars. Phillips tells the leader of the brigands, Muse (Barkhad Abdi), he can offer them $30,000, but it’s not enough, and a frank conversation between the two men later on lets us see Muse’s motivations aren’t necessarily driven by greed, but because, like Phillips, he too has bosses he needs to keep happy. The reason he and his cohorts are hijacking the ship in the first place isn’t because they’re power hungry or nationalistic, but because it’s their means for survival. To them, it’s simply a job. Bill Ray’s screenplay works at making us see Phillips and Muse as two similar men who happen to have very different backgrounds (Phillips is from a small town in Vermont, married to Andrea [Catherine Keener] and has two kids; Muse is from Somalia, barely 20, and is trying to work with the cards life has dealt him, although not very well). Both are natural leaders, smart (relatively speaking) and aware of the world’s fierce competition. They know how things work.